Two hundred dollars later, I walked out of the store with my Nook. I was so excited! Finally I was going to be like those cool people I always see on the El, carrying their Nooks and Kindles in stylish little cases while they read, I don’t know, some clever novel by one of those hipsters at n+1. My previous experience with e-readers was limited to my attempt to read Mockingjay on my iPod Touch because I was too impatient to wait until the bookstores opened. While that didn’t go so well (seriously, I felt like I was reading fanfiction – and I liked Mockingjay! ), I just knew that the Nook’s big e-ink screen would change my opinion. Sadly, the love affair with my new Nook ended as soon as I got home. 1. All those adorable and brightly colored covers? Made of leather. AGGGH. Plus, they cost like forty bucks. No thanks. 2. I chose the Nook over the Kindle because I wanted to be able to read books from lots of different sources – particularly the books I get from NetGalley, which are ePubs and only open in Adobe Digital Editions. 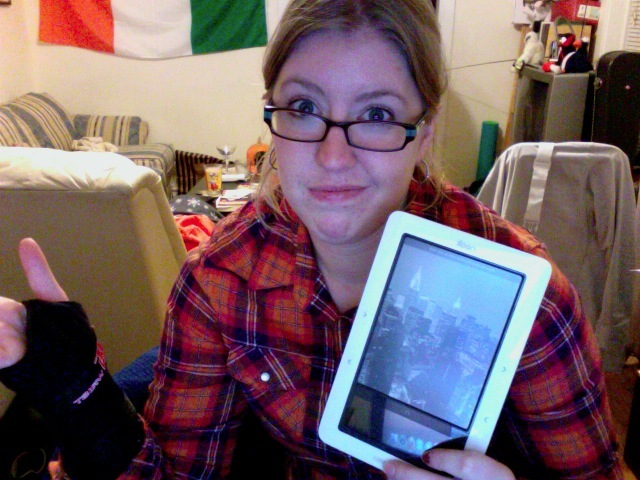 Transferring those over to my Nook was supposed to be a snap. NOPE. Guys, I know my way around a computer. I gave up after about three hours of putzing with it. 3. The awful refresh rate. It is so distracting to have the screen flash black and white at you every time you turn the page. And apparently the original Nook was orders of magnitude worse. I can’t even imagine. 4. Being accustomed to the iPod Touch, the Nook’s touch screen was a huge disappointment. It’s not very responsive, which meant I spent a lot of time jabbing at the screen and half the time it selected the wrong thing anyway. I didn’t give it much more thought, as I had 14 days to return it. For days it languished in the pile of bills and overdue library books under my desk. Until I sprained my wrist. I’m sort of accident-prone generally, which means that figure skating is probably not the best sport for me. (Although last year I broke a finger playing football and sprained my ankle playing tennis, so maybe the lesson is don’t exercise?) Still, I’d come pretty far with minimal injuries – until Wednesday, when after landing a loop jump (!) and successfully completing several RBO three-turns, I tripped over myself while leaving the ice and sprained my wrist. Pretty badly, as it turns out, so I have this charming splint (it’s black, so it goes with everything!) and an array of prescription painkillers. Typing is a pain, as are other important things like cooking and washing my hair, and lifting anything that weighs more than an ounce is out of the question. I spent the weekend trying to find creative ways to hold up The Knife of Never Letting Go (which you should read, by the way, it’s like the glorious offspring of Hunger Games, Star Wars, and Finnikin of the Rock). Then I got to the cliffhanger ending. What to do? Reading a hardcover had proven extremely difficult. Going to the store or library would require driving – not gonna happen – or getting jostled around on the El – also no. Anyway, the upshot is, Nook has grown on me, although maybe I’m just transferring my affections for Chaos Walking to the device I read them on. As far as using them in libraries goes, though, the jury’s still out.